My favorite chocolate chip banana bread recipe! When you see how easy it is to make this dreamy chocolate chip banana bread, you’ll want to make it all the time. 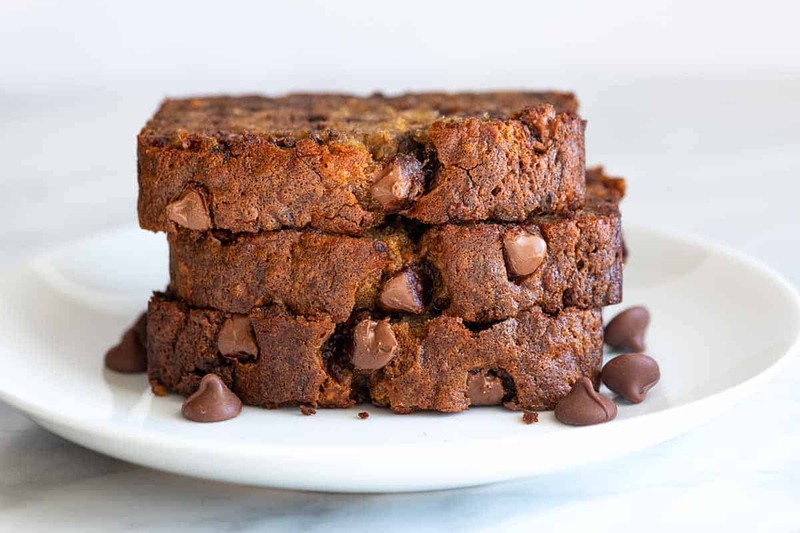 This banana bread is moist, fluffy, incredibly delicious, and is loaded with chocolate chips. Jump to the Easy Chocolate Chip Banana Bread Recipe or read on to see our tips for making it. This easy recipe is adapted from our classic banana bread that we shared quite a few years ago. Since sharing it, we noticed that so many of our readers were adding chocolate chips, we decided that we wanted to, as well. I’m so glad we did, because it’s ridiculously delicious! 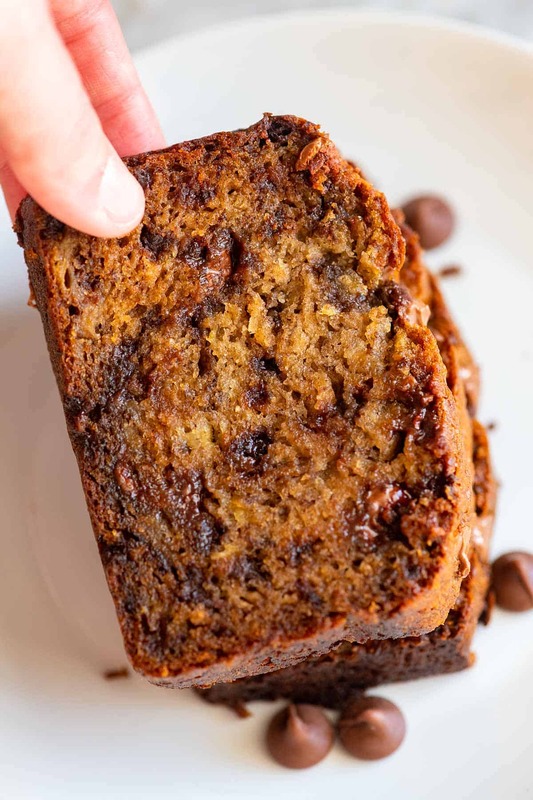 No mixer is required for this easy chocolate chip banana bread recipe! Chocolate is also essential. I’ve experimented with a variety of options including regular chocolate chips, chopped chocolate, and mini chocolate chips. When I have them in the kitchen, I love a combination of regular chocolate chips and mini chocolate chips. The mini chips melt into the batter and make the bread extra special. We use all-purpose flour, but you can use 100% whole wheat flour or a combination of whole wheat and all-purpose. 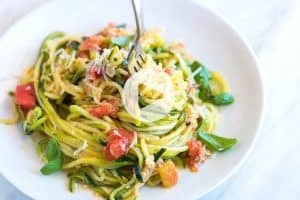 A gluten-free flour blend also works. Just keep in mind that changing the flour from all-purpose will affect the texture of the bread slightly. Baking soda is my go-to leavener for banana bread. Since posting the original recipe, quite a few of our readers asked if you can make banana bread without baking soda and instead use baking powder. While baking powder and baking soda are both excellent leaveners in baking, they are not always interchangeable. While I don’t consider baking powder a perfect substitute in this case, if you are in a pinch, you can try substituting 2 teaspoons of baking powder for the 1/2 teaspoon of baking soda we call for in the recipe below. The bread may not brown as well and the texture will be slightly different. Salt, vanilla extract, and cinnamon add flavor to the bread and make it taste amazing. I’ve experimented with other spices, too. Swapping cardamom for the cinnamon is especially delicious. Butter is my favorite fat to use when making banana bread since it adds a luscious, buttery flavor to the baked bread. For banana bread without butter, take a look at our healthier banana bread that calls for olive oil instead of butter. Brown sugar helps to make the banana bread flavorful and extra moist. You can swap other sugars (white granulated sugar or coconut sugar, for example), but the texture of the bread will change slightly. Eggs provide structure and stability to the bread. We use two eggs. For eggless banana bread, you can try using two flax eggs instead. 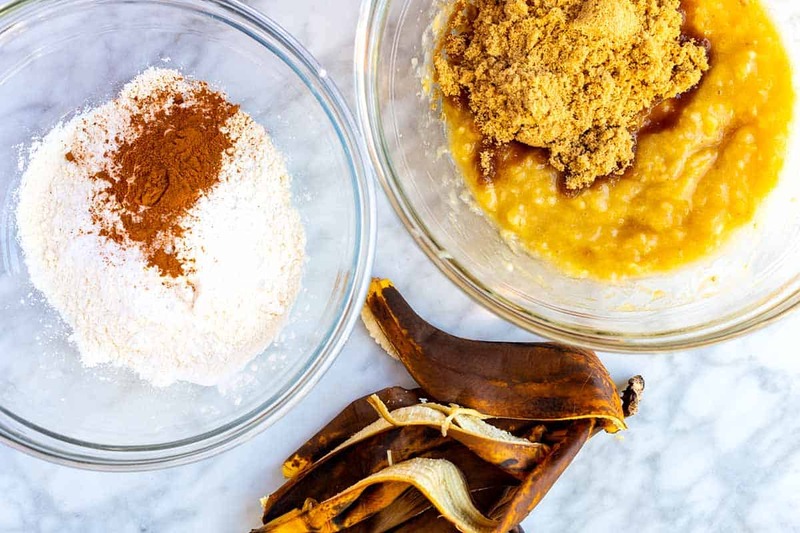 Ripe bananas are essential for the best banana bread. You can tell they are ripe when the peel is speckled and almost black. Add to a paper bag. If you can wait a day or two, throw the bananas into a brown paper bag. Bananas release ethylene (a ripening hormone). If you can place the bag in a warmer area of your home, the process will go even quicker. Bake them. For a really quick option, you can bake bananas in their peel to ripen them. This trick works best when the bananas aren’t completely green and instead are already starting to ripen. To do it, line unpeeled bananas on a baking sheet and bake in a 300 degree F oven until they look shiny and black (15 to 30 minutes). 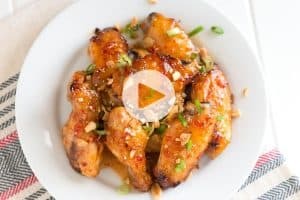 Don’t worry if some banana or juices leak out while they bake. While this is a nice tip, I do prefer the taste of naturally ripened bananas to the oven-baked option. It’s the bananas that make banana bread so moist, sweet, and flavorful. When you’re ready with your bananas, the rest of the recipe comes together quickly. I love how easy this bread is to make and honestly, I’m not sure there’s anything that smells better than this batter baking in the oven. Mash your bananas. I use a fork, no mixer or extra equipment are necessary. Whisk the dry ingredients together (that’s the flour, baking soda, salt, and cinnamon). Mix the brown sugar, melted butter, eggs, and vanilla into the mashed banana. 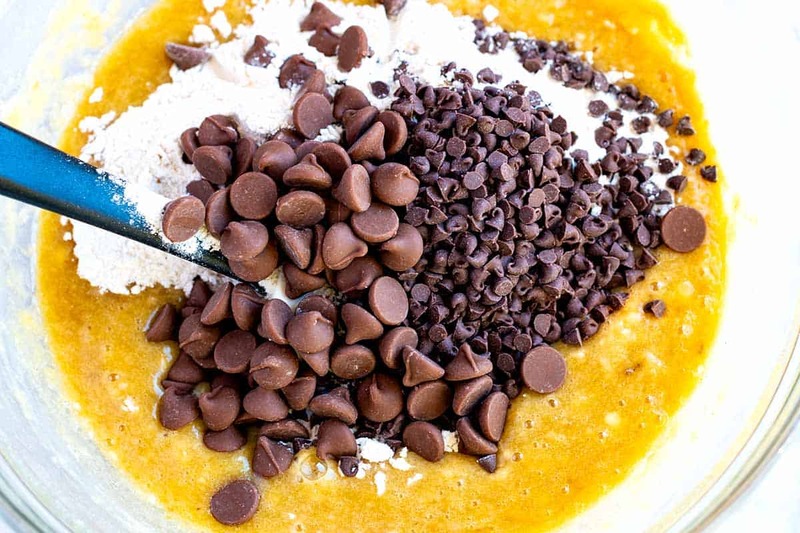 Combine the wet ingredients, dry ingredients, and chocolate chips. Spoon the batter into a baking pan and bake! I love using a combination of regular and mini chocolate chips to make banana bread. The mini chips melt into the batter and make the bread extra delicious. 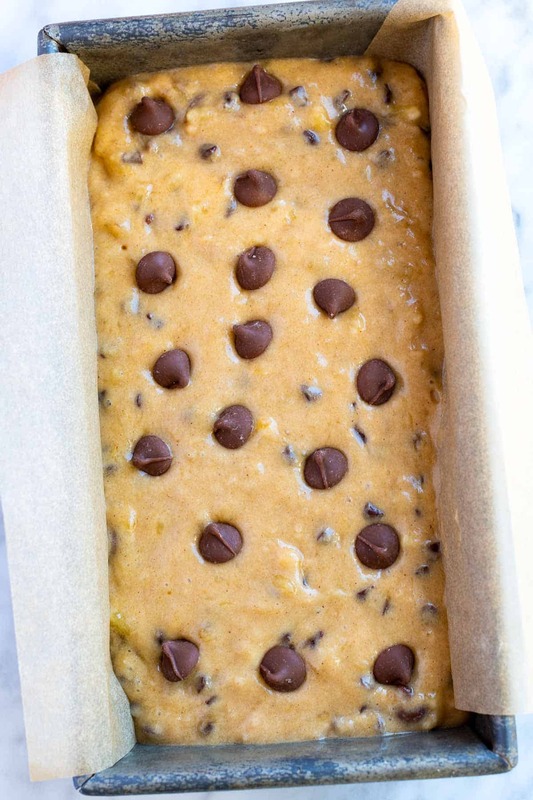 For extra chocolate goodness, add some chocolate chips to the top of the batter in the loaf pan. How Long Does Banana Bread Take To Bake? The chocolate chip banana bread bakes for about one hour. Even though that seems like a long time to wait, the smell of banana bread baking in the oven is to die for. 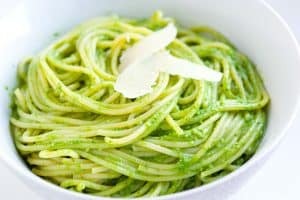 Definitely top 10 on our list of best kitchen smells! Grease the loaf pan and place the pan on an insulated baking sheet or on two regular baking sheets stacked on top of the other. This is a trick we picked up years ago. The insulated sheet (which two baking sheets on top of each other replicates), helps the bottom of the bread bake evenly so it doesn’t over brown. For glass pans, reduce the temperature. If you are using a glass loaf pan, reduce the oven temperature by 25 degrees Fahrenheit. How can I tell when it’s done? You can tell when banana bread is done when you can pierce the bread with a long cake tester and it comes out clean (you can also use a long toothpick or knife). What if it’s browning too quickly? If, during baking, the top of the bread looks like it is getting too brown, cover loosely with aluminum foil and continue to bake until done. Cool to room temperature. Since the loaf continues to cook as it cools, it is best to allow it to cool to room temperature. I leave the baked banana bread in the pan for 5 to 10 minutes before turning it out onto a wire rack where it can cool completely. Store at room temperature up to two days. Store, wrapped, in the refrigerator up to a week. Freeze tightly wrapped slices of banana bread in freezer bags for two to three months. For a healthier spin on banana bread, take a look at our Healthy Banana Bread. You could even add chocolate chips. We love these Banana Bread Muffins that are made 100% from scratch. I love adding mini chocolate chips, but they are excellent plain or with nuts. Or take a look at our Healthier Banana Blueberry Muffins. For the best, most flavorful chocolate chip banana bread, bananas need to be ripe — overripe, brown and speckled is even better. I love using a combination of regular chocolate chips and mini chocolate chips. The mini chips melt into the bread and make it extra delicious. A note on pan size: We use a 8 1/2- by 4 1/2-inch loaf pan; if you only have a 9- by 5-inch pan, start checking for doneness 5 to 10 minutes earlier. Center a rack in the oven and heat to 350 degrees F. Butter and flour an 8 1/2-inch-by-4 1/2-inch loaf pan. Place the pan on an insulated baking sheet or on two regular baking sheets stacked on top of the other. Whisk the flour, baking soda, salt, and cinnamon together, set aside. 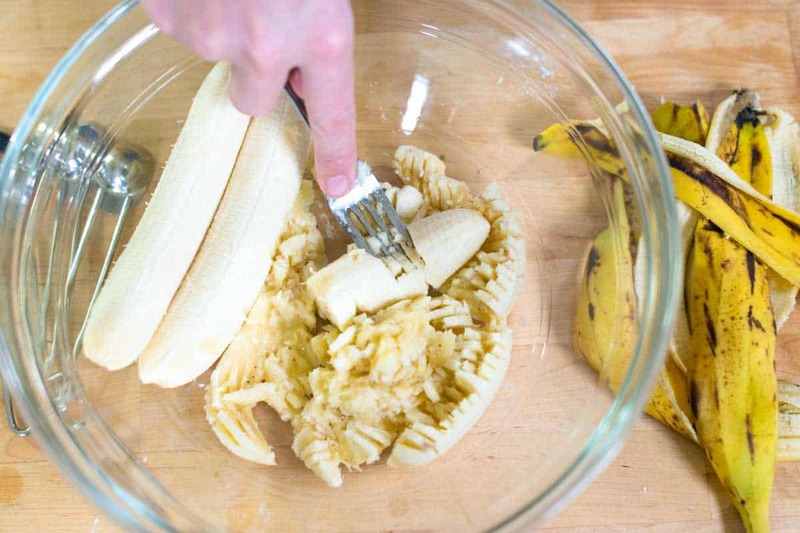 In the bottom of a medium bowl, mash bananas into a chunky paste. Whisk the melted butter, brown sugar, eggs and vanilla into the bananas until blended. Switch to a large rubber spatula. Scrape the sides and bottom of the bowl then add the dry ingredients and chocolate chips, stirring gently until the flour disappears and the batter is smooth. Pour batter into the pan and smooth the top. Scatter a few extra chocolate chips on top. Bake 55 to 75 minutes, or until a knife inserted into the center of the bread comes out clean. After 30 minutes in the oven, check the bread for color. 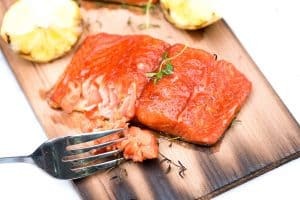 If it looks like it is browning too quickly, loosely cover with aluminum foil. When the bread is done, transfer it, in the pan, to a wire rack to cool for 5 minutes. Unmold the bread and place right side up on the rack. Cool completely. It’s best to wrap the bread tightly in plastic wrap and store at room temperature overnight or in the refrigerator for up to a week. (Since it’s just the two of us, we store in the refrigerator then when we want a slice we’ll give it a couple of minutes in our toaster oven to warm up). Vegan / egg-free banana bread: Replace the eggs with flax eggs. To make 2 flax eggs, mix 2 tablespoons flaxseed meal (ground raw flaxseed) with 5 tablespoons water. Set it aside for about 5 minutes to thicken then use to replace the eggs in the recipe.